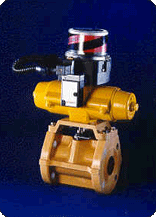 Nil-Cor offers a full range of ball and butterfly automated on/off valves and control valves. 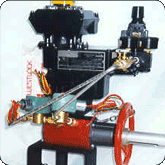 Standard actuators include rack & pinion and vane-type pneumatic actuators and electric units. 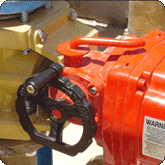 Nil-Cor can supply any actuator brand and model as required to suit the application and customer preferences. 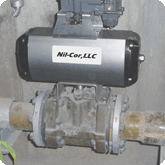 Nil-Cor automated on/off valves feature our exclusive low profile molded composite mounting bracket and stainless steel hardware. Our experienced sales engineers will gladly assist in your selection of components to do the job you need done at a sensible price. With Nil-Cor, you can count on a speedy delivery, too! 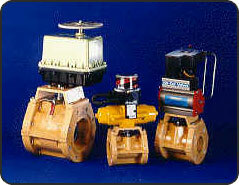 Ball Valves 1/2" through 10"
Butterfly Valves 2" through 48"
Nil-Cor ball and butterfly valves become excellent process control valves when properly equipped with today's modern positioners and accessories. Close tolerance couplings reduce deadband and low operating torque reduces hysteresis so that reliable, effective process control can be maintained. The inherent high capacity and high rangeability of Nil-Cor rotary designs lend themselves well to the generally mild control applications in the Chemical Process industries. In addition, the economics of using advanced composite material in highly corrosive applications in place of costly high alloy valves is compelling, to say the least. Inherent linear or equal percentage trims are available for the ball valves while the modified equal percentage characteristic of the butterfly is ideal for high flow, low pressure drop applications. Reduced trims in both linear and equal percentage characteristics are available for the composite ball valve. 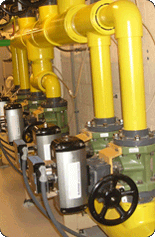 Proper valve sizing is required to obtain the best quality of control and long trim life. Nil-Cor has the experience and the expertise to steer you safely around the shoals of corrosion, cavitation and noise. 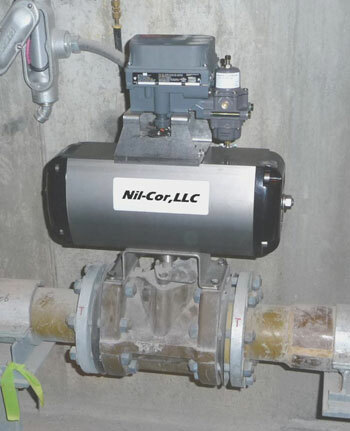 Nil-Cor supplies complete documentation, from sizing calculations to specification sheets, with every Nil-Cor control valve. Ceramic Lined Slurry Control Valves for a Flue Gas Desulphurization unit. 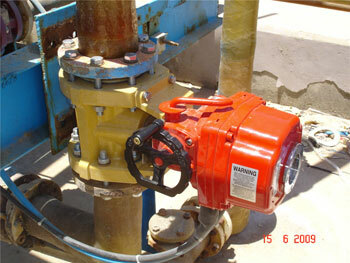 Control valve including an electric actuator with accessories and manual override for a Chlor-Alkali plant application.